How we use the eTaskboard software to be so efficient, which makes our services so inexpensive. 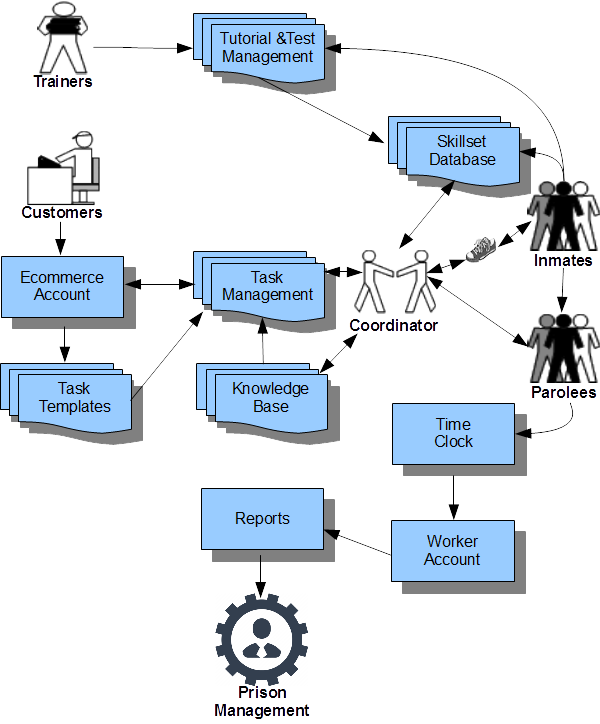 As shown by the flowchart below, we begin by using our eTaskboard software's tutorial and test modules to train our prison inmates to understand accessibility analysis and how to write the associated recommendation reports. We use this process to also populate eTaskBoard's Skillset Module reflecting the strengths and weaknesses of each inmate analyst. This inmate workforce is restricted to about three dozen inmates so the Coordinator retains a close working knowledge of their individual characteristics. The human Coordinator will use that knowledge and the skillset database later to help him assign tasks to the best matched analyst. With the inmate workforce in place, eTaskboard is open for business. Prospective customers find Access2online across the internet and decide they could use some affordable help making their website or PDF documents accessible for the blind and visually impaired. A customer begins by using their credit card, echeck, Paypal, etc. on an online form to open a customer account with eTaskBoard's ecommerce layer, with of course all such sensitive data encrypted. Once approved to use their account to propose tasks, the customer uses another online form to summarize their proposed task, what we call a pre-task. He can attach PDF documents to be updated or link to web pages to be analyzed. With Access2online's $49/hr rate in mind, the customer can specify a maximum number of hours authorized for the pre-task, thus bounding his exposure to a clear dollar amount. The customer can also specify a required due date for the pre-task. For repetitive tasks, perhaps from a web design firm for their various clients, a customer can produce a task template and generate proposed pre-tasks from that. Much faster than writing each pre-task with similar pre-task descriptions. Access2online's Coordinator next looks over the customer's proposed pre-task, including to capture a copy of the customer's web page(s). If the pre-task description is unclear or not feasible, the Coordinator will request clarification from the customer. If the Coordinator feels the authorized hours are insufficient or the due date too short, he will accept the pre-task with those hours and date updated. Most of the time, the Coordinator will accept the pre-task as is. The customer then changes the status on the pre-task form to "Authorized" if he wishes to continue, and he then has a mini-contract with Access2online to complete his task by the due date within the hours authorized. In its most basic form, the Coordinator uses eTaskboard to make a copy of the task data from his computer with internet access, with web page attachments, onto a USB memory stick. He then walks the USB memory stick (hence the term Sneakernet) over to an inmate's computer without any access to the internet nor to a local area network -- no wires beyond a power cable. The stand-alone component of eTaskboard resides on each inmate's computer, and this unpacks tasks from the USB memory stick and packs deliverable work product back onto the USB memory stick. It also manages local task operations. In its enhanced mode, all inmate computers are connected to a local area network (LAN) also available to the Coordinator. Inmate access on this LAN is restricted to one hard drive (physical or virtual) that serves their local eTaskboard software copy and provides a data directory where tasks are uploaded and downloaded, along with their attachments, by the Coordinator. This last step removes the need to carry a USB memory stick, along with its lag, inconvenience, and security risk of being lost. In its most enhanced mode, inmates can access the internet, but only through a router (physical box) controlled by the Coordinator. This router allows internet access only to designated online destinations identified by their IP address, a number unique to each domain on every server. The default router setting is to allow inmate access to only one online destination, the eTaskboard server application software. An inmate's attempt to access any different online destination, including through eTaskboard, displays an error message. This approach upgrades the security capabilities of a LAN to the online security capabilities of a physical router designed only for that purpose. Note that parolees don't need any of the above techniques to restrict access. They log into eTaskboard from their homes as could any teleworker and the Access2online customers. 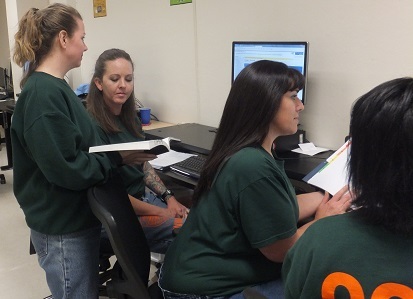 While working their task, inmates can refer to eTaskboard's Knowledge Base, a searchable resource with standards like WCAG 2.1, regulations such as Section 508 of the Rehabilitation Act, refresher training materials, past solutions to complex problems, and details of Access2online policies and procedures. Inmates can use eTaskboard's built-in timeclock to track how long they work a task, or just enter it manually. When an inmate changes a task status to developed, eTaskboard advises the Coordinator who then reviews the task deliverable (recommendation report or modified PDF documents) for quality and compliance to the task requirements. If he doesn't pass that, eTaskboard returns everything to the inmate for another try, along with the Coordinator's notes. If the Coordinator approves the task deliverables, he changes the task status to done, which triggers email to the customer. That email includes an embedded link to the task data, along with its deliverable as an attachment. Such done tasks also trigger the task's hours worked, up to the hours authorized, to be multiplied by $49 and the result to be billed against the customer's credit card or prepaid balance, along with a line item entry to the customer's account showing all paid tasks. A similar entry is appended to the inmate's and parolee's account, but the calculation is their pre-arranged labor rate times the same hours worked. That labor rate is the market rate for services similar to those performed by the parolee, which is many times the labor rate of an inmate working for the prison. The parolee can make a payment request at any time, typically twice a month, for all accumulated funds in their account. Inmates use the above payment account system to get used to working in a task-based, results-oriented system. This prepares them to work as teleworking parolees and serves as a performance metric reviewed with management, but unlike parolees, it doesn't form the basis for the pay they receive. State and federal law govern that to make sure inmates are not exploited, but it may require pay deduction for things like court-ordered victim's restitution and child support.